looking for ways to introduce Jesus to our dark world. There have been two seismic shifts in the church and culture in the English-speaking Western world over the past few decades. The first shift is predominantly a good one, while the second shift has mixed reactions. Recently, I came across a tweet from my friend, Jeff Christopherson, who leads the North American Mission Board’s Send Network. I love this! In the Southern Baptist Convention, church plants baptize almost four times the number of people than existing established churches! I agree with the hashtag, #plantingworks. Statistics like this are one of the reasons that denominations are placing a greater emphasis on church planting. The dynamic long-term growth of many church plants has helped as well. Consider Life Church with Craig Groeschel, Saddleback with Rick Warren, and Redeemer Presbyterian with Tim Keller, among many others. Compare that to a few decades ago, when church planting was on the periphery and seen as a ‘suspicious activity’ to most. Over the past few decades another shift has occurred—the Church has moved from the center of the culture and increasingly to the side. In some places, like the U.S. North East, provinces like Quebec, and cities like Portland, this shift occurred years ago. In other states and regions (like in the U.S. South), the shift has just begun. Although there’s been a greater emphasis on church planting and church growth, and church attendance has been relatively steady, the culture has not changed for the most part. In fact, it has become increasingly secular and pluralistic, with more people declaring “none” as their religious status. The writing on the wall is clear: Christians have lost their home field advantage. When I was pastoring in Montreal, Quebec, I experienced this reality firsthand. At one time in Quebec, the Church was at the center. You see remnants of this history when looking at the giant cross atop Mount Royal in the heart of Montreal. You also see this when looking at the biggest church in Canada, Saint Joseph’s Oratory, which was patterned after Saint Peter’s Basilica in Rome. Today, however, if you were to visit Montreal, you would see churches that have now been repurposed as condos and townhomes. In fact, if you were to listen to the French spoken on the streets, you would occasionally hear church words like tabernacle; the only difference is that they’re using it as a swear word instead of in a theological conversation. Instead of pouting or longing for the good ol’ days, what if we saw this second shift as a positive one? What if we understood that there are increased missional opportunities now that the Church is on the periphery? The fact that there are some who don’t have a negative predisposition to Jesus or Christianity is actually a good thing. Today in Quebec, where Christianity moved to the periphery decades ago, we are beginning to see the long-term effects that this shift has on a culture. The younger generation does not remember a time when the Church was at the center. As a result, they do not start with a negative bias against Christianity! Instead, they are seeing Christianity on the same level playing field as Islam, Buddhism, or New Age. This has provided the Church in Quebec with a unique opportunity to start afresh and enter the city as missionaries. And based on recent stories we’ve been hearing from Montreal and other areas in Quebec, we are excited and hopeful for the future where the Church is on the periphery. Embrace these shifts. Don’t hold onto yesteryear and long for the Lord’s Prayer to be recited in schools again. Don’t long for Christian values to be embraced in politics. Instead, pray for opportunities to share the gospel to this dark and dreary world. Be the light of the world to a society that just seems to be getting worse as time goes on. 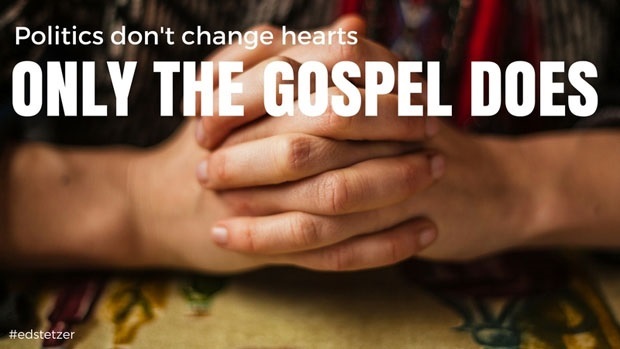 The fact is, politics don’t change hearts; only the gospel does.